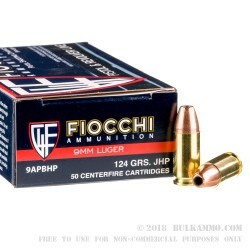 Fiocchi's 9mm 124 grain jacketed hollow point ammo is built for personal defense. This ammo features jacketed hollow point bullets designed to expand on impact creating a larger permanent wound cavity. 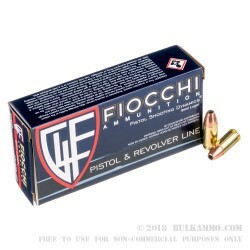 No handgun bullet technology is a substitute for practicing how to defend yourself regularly so Fiocchi makes this bulk case of 9mm self defense ammo available at a great price point for personal defense ammo for those who like to practice with what they carry. This ammo is loaded with boxer-primed, reloadable brass casings and is non-corrosive. Fiocchi has been loading ammo since the late 1800's at its home in Italy and now manufactures ammo in both Italy and in Missouri as it seeks to be able to more quickly react to American market needs by being close to the market they serve. Great buy on great ammo! A: Hello Chris! Fiocchi lists this ammunition with a muzzle velocity of 1100 fps and a muzzle energy of 333 ft. lbs. Q: How does this ammo compare to other JHP ammo? Should I use this as practice ammo instead of bulk 115gr FMJ? A: While the choice of practice ammunition is up to you, this is very consistent and accurate ammunition that you might find to be worth the upgrade over 115gr FMJ for practice/plinking/target shooting. 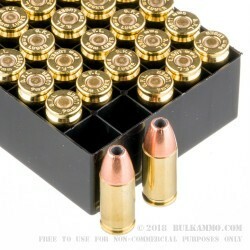 Q: Is there really a difference in FMJ, JHP, etc when looking at 9mm ammo? If so, what? A: The acronyms refer to bullet/projectile design and construction. 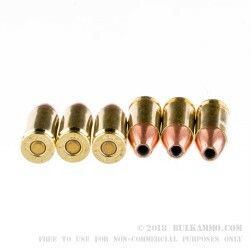 FMJ, or full metal jacket, projectiles are a good choice for practice and target shooting, while JHP, or jacketed hollow point, are more suitable for personal defense. However, JHP rounds are also an excellent choice for target shooting, and in some cases are more accurate than FMJ.